After so many years... the reeditions of Senna's MP4/7 and MP4/8 are finally here!! 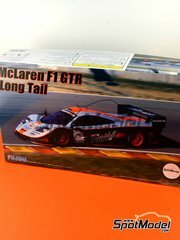 Two gorgeous kits with incredible lines, launched back to market by Tamiya in a limited reedition available for a very short time. 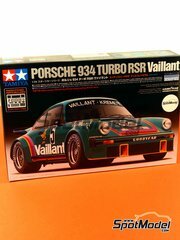 Also from Tamiya comes this week the Group 4 Porsche 934 RSR sponsored by Vaillant, the Gulf F1 GTR Long Tail from Fujimi, and the R-SV version of the Lamborghini Murcielago from Aoshima. And if you preffer flying over two wheels, we've got back the Freddie Spencer and Wayne Gardner's NSR500 decals at Spanish GP 1986, and guess what... there are just a few units!! 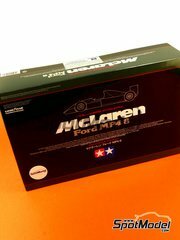 It took several years, but finally here's the reedition of the MP4/8, a gorgeous machine with an amazing profile launched back to market by Tamiya. 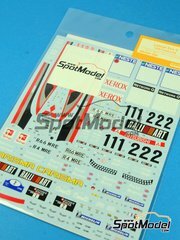 Pay lots of attention to the decals sheet, also redesigned but missing some of the original sponsors: luckily, here at SpotModel we also have the decal sheet you need to complete this kit. And don't forget that this kit is part of a limited reedition, so it will be available for a very short time. 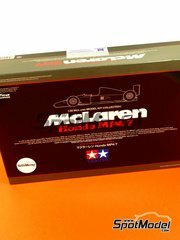 Here's the reedition of the McLaren MP4/7 we were all waiting for a few years. 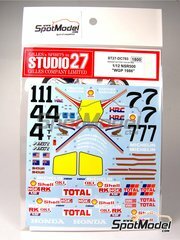 The kit includes a fully detailed engine, radiators, wheels, cockpit, ... Pay lots of attention to the decals sheet, also redesigned but missing some of the original sponsors: luckily, here at SpotModel we also have the decal sheet you need to complete this kit. And don't forget that this kit is part of a limited reedition, so it will be available for a very short time. 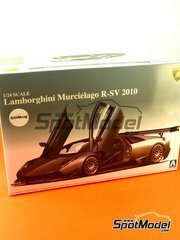 This kit includes fully detailed anti-roll bars, interior, chassis and suspension, as well as photoetches for the grid, pedals, air intakes and a few more parts. The decals are printed in Italy by Cartograf, and include Goodyear and Vaillant logos (even the bunny). This is the first of the reduced price series kits from Tameo. 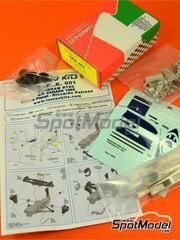 BUT reduced prices doesn't mean reduced quality: the kit includes just the elementary pieces, only a few photoetches, and the instructions are good enough. A very clever idea from Tameo allowing everyone to reach their top line products at an affordable price. 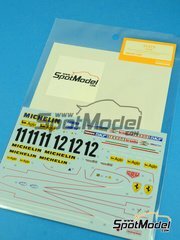 High quality decals made in Japan, belonging to a new time-limited reprint that will be available for a very short time. 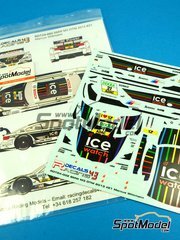 Printed in Italy by Zancheti, these colourful decals are perfect for recreating the Wittman's flashy BMW M3. Includes all the black areas in the same decal for achieving a top quality finish on your kit. Are you looking for a killer decoration for your Z4? Here it is. 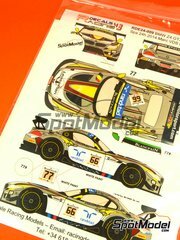 A first decals sheet filled up with carbon fibre patterns, and a second one with the full decoration for the Z4 at the Le Mans 24 hours. On top of that, these decals belong to a limited edition... are you going to miss them? 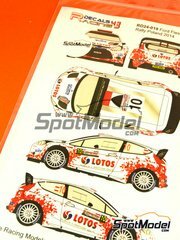 Don't miss these gorgeous decals for the Ford Fiesta WRC driven by the former F1 pilot Robert Kubica at Poland Rally. 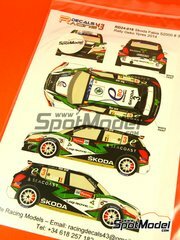 Don't miss these gorgeous decals for the Fabia driven by Freddy Loix that earned the absolute victory at the Geko Ypres rally. 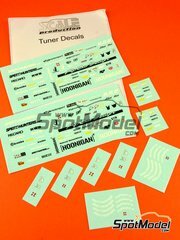 Scale Production: Decals 1/24 scale - Tuner sponsors: Speedhunters, idlers, Recaro, RWB, H&R, K&W, Sparco, Hoonigan, Ruf, STR, Illest, Tire Slayer, DP Motorsport, 9FF. A great pile of decals from most of the modern car accesories and tunning brands, like RUF, Recaro, Hoonigan, and lots more. High quality silkscreen printed decals made in Japan. These decals are a limited edition, so they won't be available for too long. Like a bullet was Wayne Gardner racing down the Bugatti corners... who doesn't remember it? Now you can have Wayne's bike in your showcase with the full Rothmans decoration, and, if you're a Freddie Spencer fan instead, you can also use these decals on your bike since both numbers are included. 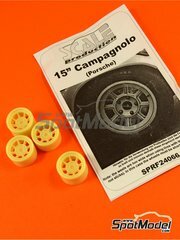 Resin rims set resembling the ones used by Porsche cars during the 60s and 70s, measuring 16,9mm x 11,1mm and 17mm x 12,7mm. Tyres not included. 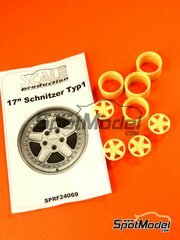 Rim measures are: 19,6mm x 11,3mm for the front, and 19,6mm x 13mm for the rear wheels. Tyres not included. 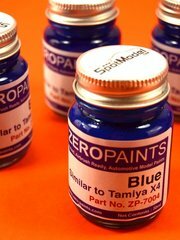 Now you can finally paint with Zero Paints and forget about Tamiya acrylics, since this tone was formulated to match Tamiya blue X-4.